Experience space without leaving your home. 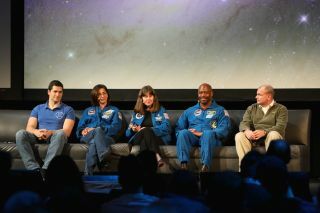 Cosmonaut Nikolay Chub and astronauts Nicole Stott, Cady Coleman, Leland Melvin and Tony Antonelli (left to right) lead the Beyond the Cradle 2019 event finale on March 14, 2019. CAMBRIDGE, Mass. — Going to space is hard, but a panel of astronauts say communication, community and art can make it a little bit easier. At the Beyond the Cradle 2019 conference on March 14, from the Massachusetts Institute of Technology Media Lab, an astronaut and cosmonaut discussion concluded a day full of tech, science fiction, and optimism about the future of space travel and life in space. NASA astronauts Cady Coleman, Leland Melvin, Nicole Stott and Tony Antonelli and Russian cosmonaut Nikolay Chub represent a wide range of experience levels, from retired veterans all the way to newly minted astronauts. In a panel discussion, the astronauts explored the wonders and never-before-told trials of spaceflight in front of a packed room. "On my first mission I had one of those afternoons where you needed just a little bit of alone time," Antonelli, a retired astronaut and former commander in the U.S. Navy, said during the panel. "[I thought], 'OK, I've gotta get somewhere quiet and close my eyes for just a couple of minutes.' Of course, I didn't think to tell everybody that that was the case. There were big rectangle boxes or bags and they were all bungeed … so I slid under the bungee cord in between these big bags and close[d] my eyes. I don't think I was there very long [before] one of my shuttle crewmates floats up upon me, [as I lay there] bungeed, with my eyes closed. I don't know what he thought he found, but he screamed." Using Antonelli's story as an example of what not to do, the astronauts stressed the importance of building bonds with their crewmates and maintaining an open dialogue about one another's needs while aboard the International Space Station or space shuttle. Coleman, a retired astronaut and chemist, recounted a particularly moving evening she spent with an international crew aboard the space station celebrating Yuri's Night — an event first created by another Beyond the Cradle speaker, Loretta Whitesides, to celebrate the first crewed spaceflight, cosmonaut Yuri Gagarin's 1961 mission. "It really meant a lot to us," said Coleman, showing a photo of the space station crew wearing shirts with Gagarin’s face. "Our crew was onboard the station on April 12, 2011, 50 years [after Yuri's flight]. There's a lot that that shirt says. It's a picture of Yuri Gagarin. The fact that it's on the space station, with one for [each]of us, is actually thanks to Loretta Whitesides … And I think that individual people make these kinds of differences." When reflecting on other moving moments they'd all experienced either in training or aboard the space station, the spaceflyers emphasized how important it is for more than just astronauts to gain this cosmic perspective. It's possible to see videos of space travel or hear first-person stories, but the astronauts said to really express the overwhelming feeling of seeing Earth from space — an experience known as the overview effect — they need to turn to a more expressive form of communication, like art. In lieu of sending artists in residence to the space station just yet, retired astronaut Nicole Stott has begun searching for a way to express her experience of space through art, following an experience she had painting aboard the station. "When I was thinking about retiring, [I thought], 'What am I going to do that's kind of different?' [And] I just kept coming back to this really special experience [of] getting to paint in space," said Stott. "Art is like this universal communicator … and I thought I can use art to reach audiences, unlike this one, that don't even know we have a space station and that this wonderful place exists. "And I can also encourage them to consider themselves Earthlings, to understand we live on a planet," she added. "All of those kinds of things that I think really are the core of what I came back to Earth with." Since returning home, Stott has worked with the Space for Art Foundation and the Spacesuit Art Project to help kids explore the intersection of science and art. The bright, patchwork-style spacesuit Stott helped design has even found its way back to the space station, bringing her mission full circle. "I came back to Earth with this undeniable truth of 'Wow, we are already all in space together.' And we need to start acting more like that," Stott said.